A couple of days ago David Troedson at Elvis Australia wrote me and asked permission to run my interview with Per-Erik “Pete” Hallin on his website. Not only did he like my questions, he also thought “Pete” shows amazing insight and was impressed at his accuracy in memory. Obviously, I said yes. And I have to admit that it feels good that all the interesting things “Pete” has to say about Elvis, and especially his love for gospel music, reaches a much larger audience that way. And speaking of interviews, be sure to check out all the latest interviews with friends and family about Elvis Presley, featured on the Elvis Australia site. But be careful. You could easily lose track of time going through all that fascinating stuff. While waiting for the new soundboard release from FTD, Another Saturday Night (Shreveport, June 7, 1975) to arrive, I've been thinking about what other official soundboards I'd like to see in the near future. The reason for this is the interview with Ernst Jorgensen that I quoted in my latest post, where he also answered a question about how longer he thinks he can continue to release soundboards. “A shot from the hip – two to three years? Ask me again then,” was his answer. The Shreveport concert is an example of a soundboard that has not been released on bootleg before, not even as an audience recording. And though Ernst Jorgensen and Roger Semon try to release unreleased soundboards whenever possible, in later years a couple of albums that have previously been out as bootlegs have been put out by FTD as well. That is something I applaud, as concerts such the ones in Dallas and Birmingham in December, 1976 (Showtime!) and in Boston in November, 1971 (Elvis As Recorded At Boston Garden '71), all have a given place in the official Elvis catalog. So, continuing on that line of reasoning, I'd like to present three imaginary FTD releases, all of which consists of soundboards that have been bootlegged before. To me, they represent concerts that are so essential that they should be officially released as well. This would be the perfect companion to the recently released On Stage FTD classic album. 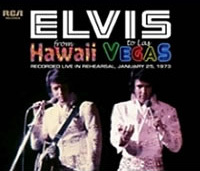 Featuring the January 26 opening show, as well as the February 23 closing show (released by the import label Madison in 2008 and 2007, respectively), both concerts include the show opener “All Shook Up,” a track that was never professionally recorded by Elvis' producer Felton Jarvis for the original On Stage album. The shows are first class, with gems like “That's All Right” and “True Love Travels On A Gravel Road” from January 26, and “Blueberry Hill”/”Lawdy Miss Clawdy” (Elvis plays piano) and “One Night” (Elvis plays electric guitar) from February 23. And although the sound isn't as perfect as on the multi-track recordings RCA did during February 15-19, it's still very good. When I read about a week ago that Elvis afternoon show in the Houston Astrodome from March 3, 1974 has just been re-released by the import label Venus under the title The 8th Wonder Of The World (it was originally released as Elvis – Event Number 8 in 2000 by Madison), my first thought was that this must get an official release as well. What's so interesting about it, is that Elvis did not use an orchestra, just his rhythm section and back up singers. This gives you a taste of what Elvis would have sounded like had he chosen to go on tour with a smaller group of people on stage. It's a special, great sounding show, including highlights such as “Trying To Get To You,” “Johnny B. Goode” and “Polk Salad Annie.” Maybe Elvis gave an extra effort because the crowd was so big (43,974 fans) or so far away (he performed on a portable stage that was moved into the center of the arena). A favorite concept of mine since I wrote about it in 2009, Mid-South Magic includes all three soundboards available from Memphis, one from March 16, 1974 , another from June 10, 1975 and finally the last concert Elvis did in his hometown, on July 5, 1976. The first two were released as Bringing It All Back Home by the Venus label in 2009, but FTD still has a chance to do it better, by including the 1976 concert as well, which is one of the best from the bicentennial year (it was re-released by the Audionics import label under the name of The Final Homecoming in 2009). Then, if Ernst Jorgensen presented the whole thing as an “audiovisual documentary,” together with an accompanying book packed with great photos, as well as written liner notes covering the stories behind the pictures and the shows, we should have us a real winner. This post only cover soundboards, not audience recordings (although I feel that FTD should release Elvis' last concert from Indianapolis on June 26, 1977 in this form, just as they did with the Pittsburgh show from New Year's Eve, 1976). It doesn't cover all the officially unreleased rehearsals or concerts from That's The Way It Is or On Tour either, or the rest of the professionally recorded shows from 1969. That they should be released is obvious. “A BOY FROM TUPELO – THE COMPLETE 1953-55 RECORDINGS” includes for the first time in one collection every known Elvis Presley SUN master and outtake, plus two private records Elvis paid for with his own money, as well as thrilling radio and concert performances from the period. This 3 CD package features 10 previously-unreleased cuts. The accompanying book is, in essence, a fully-illustrated travelogue. It thoughtfully details the birth of Elvis' career through facts, anecdotes, documentation, many rare photos, and a succinct narrative. Independence Day 1954 is when this uniquely American saga begins, less than 24 hours before his first professional recording session, and it ends in December 1955, when the rights to Elvis' SUN tapes officially expire, and the singer leaves Sam Phillips to record for RCA. This is Elvis Presley before he becomes world-famous, and the mystery of how this amazing young man readies himself for stardom, achieving success on a level that no one could have dreamed possible. All audio has been re-mastered and restored as best we could, but Disc 3 has pretty rough audio. The book is 512 pages in 12” by 12” format and includes more than 500 photos of which about 200 are previously unpublished. If you are not an expert in this period of Elvis’ career, a lot more photos will be new to you. Many familiar photos will be seen in best ever quality, but since this is a historical document, there will also be many images of less quality, included for their rarity value and support of the story. The book also includes, for the first time, Steve Sholes’ original notes on the Sun tapes. The project will come in a slip case (like “YOUNG MAN WITH THE BIG BEAT”) that holds both the book and the CD holder (a double album type package). 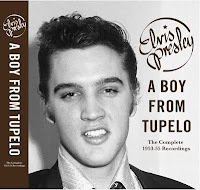 No doubt A Boy From Tupelo – The Complete 1953-55 Recordings is one of the most important Elvis releases in a long time. With a price tag around €99 or US $126 it's also one of the most expensive (not counting The Complete Elvis Presley Masters box set). But, as Ernst Jorgensen has been working with this ambitious project for many years now, I'm sure it will be well worth both the money and the wait. Ernst - The CDs with it will be an extra added bonus. No, we don’t have ‘Uncle Penn’, ‘Tennessee Saturday Night’ or ‘Rock Around The Clock’ as mentioned in the rumours that keep circulating. However we have a great selection on three CDs. The first will be The Masters, the second The Outtakes and then the third with everything else that we could get hold of. However I don’t think people should be buying this release just because of the CDs, but because of the photos, the information and the complete package. EIN – How much on CD3 is going to surprise people? Ernst – Not too much, but it is going to sound better than they have ever heard before. There’s obviously going to be the copy of ‘That’s All Right’ from Meridian 1955 which is kinda’ cool. There’s also a handful of other pieces that people have never heard before, plus Kevan has been working on the radio recordings like ‘Fool, Fool, Fool’ to get them sounding much better. And also on CD2 there will also be a few little bits and pieces including outtakes that people have never heard before. Nothing earth shattering but it will be very nice to listen to. We’re still negotiating on one more particular track, not a rare song but another performance we would like to include. But unless the owner moves on from the high price that FTD cannot even consider, then we’re not getting anywhere. As Voice's piano player, Swedish musician Per-Erik Hallin got to sing and play with Elvis in 1973 and 1974, both off and on stage. Here follows the second part of an interview I did with him about six years ago, for a radio show called Rock MeLord dedicated to Elvis gospel recordings. Elvis also sang religious material on stage when you were with him, including “How Great Thou Art” which originally is a Swedish hymn, called “O Store Gud.” I know you tried to convince Elvis of this, but that he didn't believe it. Would you like to share some thoughts on that? Yes (laughs). My recollection of it was that I had heard that it was a Swedish song from the beginning. But I myself wasn't 100-percent sure. But I said to him, “I think this is a Swedish song.” But he just thought I joked with him. He probably thought that just because he liked it so much, I had to say that it was Swedish, he didn't take it seriously. And I got a little unsure and didn't hold my ground, so nothing more was said. Unfortunately, like many Americans, Elvis thought that it was American. But afterwards I have learned more about “O Store Gud,” and know very well that it's Swedish. Although no one really knows where the music comes from, the original lyrics are written by Carl Boberg in the late 1800's. You were on stage when Elvis performed “How Great Thou Art.” What did you think of his performance? I liked it a lot. But the strongest memory I have of it, was one time when I wasn't on stage, and could listen to him perform it, I remember I was very moved by it. He did the song with an incredible feeling. I was just on stage during a particular period, and that was because I was standing in for a guy in the background chorus. That was during a tour in March 1974. And here's something that is worth telling, because I think it's funny to us Swedes. Elvis won three Grammy awards during his career, and not one for a rock song. The first Grammy was for a gospel album called just How Great Thou Art, that he made in the 60s. And then he got a Grammy for He Touched Me, and that song exists in Swedish as well. “Han Fann Mig,” it's called, and it's a Christan song also. Then he received a Grammy a third time, and that was precisely for how he sang “How Great Thou Art” at that concert in 1974. And I didn't understand that until many years afterwards. The same day that someone told me, I had hung a picture of “O Store Gud,” a painting on that theme, in my living room, and someone called and told me that Elvis had been awarded a Grammy precisely at that occasion. And I was actually so moved that I cried, it felt very nice, just because I knew what huge feelings he had for these particular songs. You yourself got to perform a song, “I Couldn't Live Without You,” a few times. Can you tell something about it? Yes, I actually played several songs that I'd written for Elvis, and I'll be honest and say that he didn't decide on any of them except one. But it was very nice that he liked that particular song. And I told him that this song, it's no ordinary love-song, but the one this song give its love to, it's Jesus. It's about Jesus, and he was aware of that. And so it's a special feeling that he asked me to sing it at various times. And it's a fond memory for me. A little, I actually have contact with a guy named Tony Brown, among others, who took over my role as a pianist in the warm-up band. Because that was what I was, I was not in Elvis band, that is. But Tony Brown went on to become Elvis' pianist as well, during the last years. And I know that he also has told some very good memories, I've seen a documentary that is based precisely on this that we're talking about, and in it Tony has told some very nice things about these moments, which went on after I left, when he continued to sing gospel music. I think it's something he did during his entire career, from the beginning there was this love of gospel music, as I understand it. Quite often, actually, because there are many very nice memories. But there are also things that ... I also saw the downsides that come with such incredible fame. And I remember the one time when he was going to show all his gold records. If you can imagine that you would have, in your own home, a large room with a bunch of gold records that look like a whole museum, what an odd feeling. And it was for him as well, actually. I remember that he said, “When I enter this room I can't believe it's me who has done all this.” So he expressed some kind of disorientation in front of the phenomenon that was Elvis Presley. But there stood the man Elvis, who was an ordinary person and couldn't quite grasp what had happened. And there is nobody who can live up to being put on a pedestal, as is often the case with this kind of fame. It gets pretty lonely up there. And it's not so easy to have a normal friendship, to know who would have been your friend, even if you had not been rich and famous. So life isn't so simple. But I thought that those of us that still came pretty close to him, that for us it became like a real friendship, and when we sang together and he was one of the gang who was singing, and all that. Those are very, very fond memories. Six years ago I interviewed Swedish musician Per-Erik Hallin, who sang and played piano with Elvis in 1973 and 1974 (when he was Voice's piano player). “Pete,” as he was called by Elvis, has mostly worked in the genre of gospel music, and the interview was done for a one hour radio program titled Rock Me Lord dedicated to Elvis religious songs and broadcast on Easter, 2006. As only parts of it were used in the program, I've been thinking for some time to include a transcript of the whole interview here on my blog. As Per-Erik really has a lot of interesting things to say about Elvis, and especially his love for gospel music, I hope you'll enjoy what you read in this post and the next. The first time I met Elvis, I was over to audition for the warm-up band, and didn't know from the beginning that I would meet with Elvis then. But in the midst of the few days I spent in Nashville, they suddenly said that Elvis was now doing a recording session, so we're going down there. The three singers in the group would sing on his album but the rest of us would just go along. Then we were in Elvis' house, in Graceland, and played a few songs that I had rehearsed with them. But I didn't really understand at once that the songs were proposals that he might bring with him to the recording session, but it was. I then heard how the producer and Elvis said, that if we choose this song, then maybe this guy [Per-Erik Hallin] can join in and play a little too. And I thought I had probably heard wrong, this is something I wont take out in advance. But it actually turned out so that I could join in and play a few songs. And there was another pianist in the studio too [David Briggs], so we were two, and sometimes we played double-keyboard as well. Well, it went well, I probably would have been more nervous today, I think, than I was then, I was so young (laughs). But it was really fun, because he recorded most of it right away, something most artists don't, not even then, when you record the rhythm track first and then the singer does the vocal overdub some time later. But this was more like a live performance, even the background chorus was recorded directly. Very relaxed, very relaxed. There were no rehearsals, but they were playing a demo again and again and again. And then, all the musicians wrote down what they heard, chords and such. And then they used numbers, it was the first time I've seen it. Instead of the name of the chords you wrote 1, 2, 3 and 4. They called it “the Nashville number system.” Then suddenly it was time to make a recording and that was more like a “jam,” it was very relaxed and inspiring. I really like it, and it has actually been an inspiration to me as well, to a song that I wrote later. It's in a style of music that I like. Yes, one of the songs does have very nice lyrics, and it's called “If That Is not Love.” But I didn't play piano on that particular song, David Briggs did. But it's an incredibly strong and beautiful gospel text, I think. Because he wanted to sing them, and it wasn't necessarily he who sang, many times he just listened or sang a part, and he especially liked to sing bass. And I think he felt that a lot of what was in the show that he did was quite superficial, but now it was serious in a way, it was obvious that he did this with all his heart. I've been thinking a lot about it afterwards, Elvis was exposed, I would almost say, to an idolatry that had no limits at all, it went way out of hand, and still does many times. And in the midst of it all, he was just an ordinary, simple person. And it felt just like this [the gospel singing] became a refuge for him. I also think it's pretty touching to think that a person being exposed to so much idolatry likes to just be one of the gang and sing songs like “There's Somebody Bigger Than You And I” and the like. It's as though everything gets a different perspective in gospel music. In ordinary music you look up to the singer who stands there on stage. But I tend to think that in gospel music, you get to raise your eyes and focus on the one that has given the singer the gift to sing, and then everything gets a more healthy perspective, and I think he felt something of this very strongly. I think I can say without hesitation that gospel was simply the type of music he liked the most. And I think that if anyone of those who knew him well, and perhaps better than I did, would sit next to me, they would nod and agree and say, “yes that's the way it was.” And it has been said many times and I myself have experienced it. To me and my one and a half year old daughter, Elvis Country means two very different things. 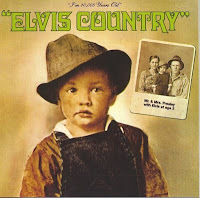 Looking at the iconic photo of the two year old Elvis clad in overalls and a broad hat donning the cover, I immediately recognize my all time favorite Elvis album, while all my daughter sees is a baby. I've written earlier about me and my daughter's routine of leafing through a book titled Elvis: The Complete Illustrated Record, where we always start with page 76 where there's a picture of Elvis from G.I. Blues, surrounded by six babies. My daughter then points happily to the picture and says one of her favorite words, which is ”bebis.” (Swedish for ”baby”). Now, I can report of another everyday activity having to do with “Is” (my daughter's way of saying Elvis) and “bebis.” It all started maybe a week ago when she succeeded in flipping through some of my LP albums, before I managed to steer her away. But not before she had caught a glance at a certain album titled Elvis Country where the picture of Elvis immediately caught her attention. “Bebis,” she shouted excitedly as I lifted her up, sat myself down in a chair close to my LP and CD collection, and placed her in my lap. “Yes, a baby,” I agreed, “and his name is Elvis.” She nodded happily, saying “Is.” She then pointed at the LP albums, once again uttering the word “bebis,” only this time in a more commanding tone. Sensing my discomfort in letting her hold the big, fragile vinyl cover, she got angry, looking me sternly in the eyes and screaming “bebis!” at the top of her lungs. What to do? I looked between her frustrated face and my LP records, thinking fast. Then I came up with an idea. Stretching out my arm, I reached for the earliest CD version of Elvis Country released in 2003, pulled it out and showed it to my daughter, hoping for the best. After all, a CD cover isn't as vulnerable as it's vinyl equivalent, I figured. I even let her hold it, which was a bold move in my book. I need not have worried. Recognizing the picture on the cover her whining was replaced with content once again, After saying “bebis” once again, this time in a more civilized way, she turned the cover around, carefully examining the more modern photo of Elvis on stage grazing the back. “Is,” she repeated, making me smile as she handed the CD back. We then went through all the variants of Elvis Country I could find in my collection, including the extended version from 2000 with bonus tracks (that one was a hit as it sported a young Elvis on the back as well), the recent legacy edition (I quickly recovered it when she started to press on the paperboard of the digipack) and the FTD 2008 release (held at arms length). And though I was pretty sure she had really enjoyed studying all the portraits of the unsmiling child that was Elvis at age two, it was clear that my ploy hadn't worked. Once again pointing at the LP albums, she looked at me and said, “big baby.” Sure enough, she'd remembered the LP album cover with the bigger looking photograph of Elvis as a child. In that moment I surrendered, pulling out my Elvis Country LP and handing it to her. “Baby,” she said happily, then looked at the smaller black and white photo, which included the parents, saying, “mommy” and “daddy.” In that moment I didn't mind her holding the album, but when I saw the cardboard starting to bend, I fought back again, gently pulling it out of her small hands, feeling a little guilty. After all, she was interested in daddy's favorite Elvis album. Then I had another idea. Why don't get her a copy of her own? Close to where I live is a store selling second hand LP albums. So what I did was visit the store, bringing my daughter along in her stroller, and starting to browse through the Elvis LP's available. Pretty soon I found what I was looking for, a nice copy of Elvis Country, and not very expensive at that. Returning home with the record, I took a closer look at it. In that moment I realized that I just couldn't bring myself to give such a nice copy to my daughter, knowing that it would eventually get pretty bend and broken. The idea is to let the fans pick three favorite songs from seven categories: 50s, 60s, Gospel, Love Songs, Movies, Country and In Concert (an eighth category, R&B, is also announced on the site, but nowhere to be found where you're supposed to cast your vote). The top 3 most voted songs from each category will then make the I Am An Elvis Fan album. Initially I thought this sounded pretty exciting. But a closer look at the seven categories reveals that they only consist of 13 songs each, in total 91 songs to choose from. In reality not more than some 13 percent of Elvis' 711 master recordings. Don't get me wrong, they are great songs too, but I think in all probability the Elvis Information Network is correct when they write that, “the album will contain no nice surprises and therefore be yet another ultimately disappointing “Greatest Hits” release. For the I Am An Elvis Fan album concept to have been really interesting, I think there should have been the possibility to add your own choices of songs, at least one song anyway, under each category. And where is that R&B category? Come to think of it, a 70s category is essential as well. Or maybe a better solution could have been some kind of Internet variant of the model used by the British Fan Club for the LP album Elvis In Demand back in in 1977. The idea was for the fans to write down five Elvis songs they would like to see on the album, and in that way try to stay away from the mainstream compilations at the time. It was a success. As for the I Am An Elvis Fan album, I'm not so sure. Voting ends at 11:59pm ET May 12, 2012. Song results and cover art to be revealed on June 15.